Following the rest period in Northern Ireland, No. 303 Squadron was relocated to RAF Horne, close to the theatre of war. Below are the copies of this moving order courtesy of Robert Walsh. I kept spelling and spacing unchanged. Biggin Hill, 85 (Base) Group, 142 A.F.H.Q. Scorton. Further my O.346 21st.April on move of 303 Sqdn. and Echelon. (a) Squadron to take aircraft. (b) NoM.T. to move, vehicles will be supplied from another source. (c) Take all equipment in A.P.3020 vol.1 part 1 col.34 part 2A cols 6A/6C. No. 303 /Polish/ Squadron, MOVEMENT ORDER No. 8 by Squadron Leader, T. KOC, DFC. ORDER for movement of No. 303 /Polish/ Squadron from R.A.F. 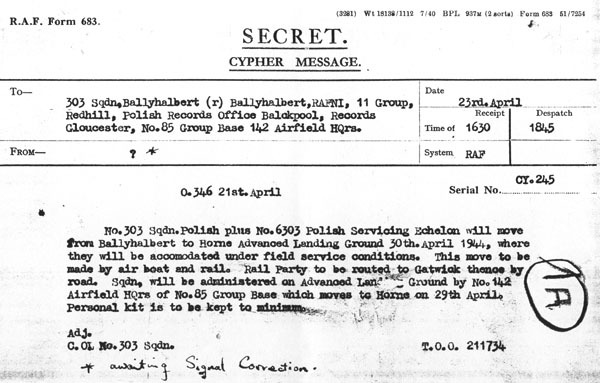 Station BALLYHALBERT to HORNE Advanced Landing Ground on 30th, April, 1944. INTENTION to move No. 303 /Polish/ Squadron complete from R.A.F. Station BALLYHALBERT to HORNE Advanced Landing Ground. 1. Air party. 30th April 1944. Appendix "A"
2. Road parties 28th, April, 1944. Appendix "B"
3. Main rail party 23th, April, 1944. Appendix "C"
for HORNE. The Tiger Moth will leave at the same time. d/. Owners of private vehicles will make their own arrangements for removal of same from R.A.F. Station BALLYHALBERT. e/. Transport as required wil be supplied by M.T. Section R.A.F. BALLYHALBERT. Stn. Commander O.C. No. 6303 Servicing Echelon. Stn. Ad. Officer. O.C. 303 Sqdn. Stn. Adjutant. Flight's Commander "A" and "B". Senr. Eqp. Officer. Polish Liaison Officer HQ.A.D.G.B. Catering Officer. Polish Records Office. Flying Control. Air Officer i/c Records. Gloucester. S.W.O. HQ. No. 85 Group. M.T. Officer. O.C. No. 142 Airfield HQ. Stn. Eng. Officer. R.A.F. Gatwick. Officer i/c Armoury. Sqdn. Adjutant. P-1895. F/O. L. KRASZEWSKI 792032. F/Sgt. LEWICKI S.
783220. F/Sgt. ZYGARLICKI L. 792239. F/Sgt. MARTENS E.
781507. F/Sgt. BARTKOWIAK Z. 780622. F/Sgt. SZADKOWSKI J. 794557. F/Sgt. LUBIENSKI W. 794474. F/Sgt. POLILEJKO J. 792281. F/Sgt. SZNAPKA W. 794841. Sgt. BEZWUKLO Z. 780938. F/Sgt. BIENIEK H. / Tiger Moth. 782917. F/Sgt. ROKITNICKI A. 793627. F/Sgt. KEMPKA W.
161137. A/P/O. J.?. NICHOLS /British/ 783817. CPL. STANKOWSKI K.
/&/ On the strength of this Unit, but has not been reported according to the HQ.A.D.G.B. Signal GP. 429.